Destinations weddings are virtually stress-free. With full-time wedding coordinator Christal Felman, you destination wedding in Orlando Florida will be everything you have always dreamed of. Orlando offers great all around weather and value for your money. 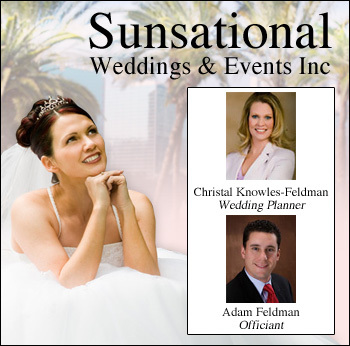 Christal Felman with Sunsational Weddings can plan the perfect wedding. They offer amazing wedding packages and deals and a variety of suggestions for ceremony and reception locations. Destination weddings can offer a once-in-a-lifetime reunion opportunity and what better place than Orlando Florida. Orlando is a great destination for all family and friends. Sunsational Weddings will help you take care of all the ceremony and reception essentials. Relax while everything from your officiant and photographer, to your catering and dance, are all looked after. They also help you plan a wedding that reflects your true colors and unique ideas. Call Christal Felman today for wedding packages and ideas in Orlando Florida.